In its annual “Next Generation” program, Boston Ballet (BB) features students, trainees, and pre-professional dancers with music accompaniment performed by the New England Conservatory (NEC) Youth Orchestra. 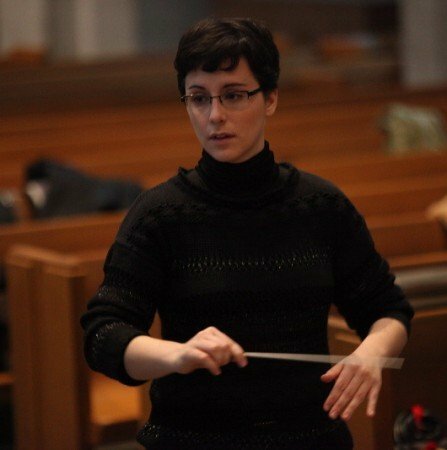 Having attended this event since 2014, I have to say that the star of this year’s show was Geneviève Leclair, assistant conductor of the Boston Ballet Orchestra, who guest conducted the NEC ensemble. There were also several memorable dancers, but the award for sustained achievement in music performance, including Act III of Tchaikovsky’s The Sleeping Beauty and excerpts from Ambroise Thomas’s Hamlet, goes to Leclair, who conducted the orchestra with such verve and precision that its members sounded not like the students they are, but like seasoned professionals. In addition to being essential to the audience’s enjoyment of the program, the music was an absolute gift to the dancers because it gave them the structure and direction they needed. Leclair’s confident dynamics and tempos, crisp rhythms, and crystalline phrasing created powerful forward momentum. Moreover, each style in the Tchaikovsky score was vividly realized – from the meowing of Puss in Boots and the White Cat, to the chirping of the Bluebird, to the stirring rhythms of the polonaise and mazurka. How wonderful for the dancers to be supported by music of such high caliber. Act III of The Sleeping Beauty (with choreography by Marius Petipa, Peter Martins after Petipa, and Alla Nikitina, a Boston Ballet School faculty member) also introduced us to the second star of the evening: Lex Ishimoto as the Bluebird. Before I saw him in the role, I couldn’t imagine a pre-professional attempting this supremely challenging pas de deux, but not only did he take it on, he triumphed. From the beginning of his solo variation, when Bluebird does nothing but show his avian port de bras, it seemed as if this sequence would be something special, and it was. The perfection of his lines, jumps, and brisés volés; his elegance combined with unwavering stamina all added up to a performance of immense accomplishment. Abigail Merlis as Princess Florine was also impressive, but this pas de deux usually belongs to the male dancer (with several notable exceptions), and Ishimoto made it his own. Act III continued with the Jewels pas de quatre, in which Christian Pforr also showed refinement and mastery, and in the Court Jesters divertissement perhaps a new star was born. Noah Parets is the kind of performer one always hopes to see and rarely does. The smallest of the three jesters, Parets lit up like a Christmas tree when he was onstage. His joy was so infectious I could hardly take my eyes off him. He smiled as if he was having the time of his life while executing all kinds of acrobatic moves, and his eyes flashed at the audience as if to say without a trace of conceit, “Look what I can do! Isn’t it great?” He exudes a special kind of stage presence that invites the audience to share his exhilaration, and it’s irresistible. The grand pas de deux had some stability issues, particularly in the balances and fish dives. After the performance I was informed that this couple, who stepped in for injured dancers, had a week to learn their roles. It’s really no criticism of the dancer who played Prince Désiré to say that it would have been preferable to have had a more experienced partner for Princess Aurora. Expecting anyone to perfect such complex partnering skills in a week is unrealistic. As Aurora, Brenna Flaherty was lovely to watch and accomplished; she also showed admirable sang froid. An earlier piece on the program was choreographer Jorma Elo’s Over Glow, danced to recorded music by Mendelssohn. The classical positions were the best part of this work; the mechanistic gestures, which can be found elsewhere in Elo’s oeuvre, begin to wear thin after repeated viewings. Be that as it may, the dancers showed the kind of well-honed contemporary technique for which BB is known. 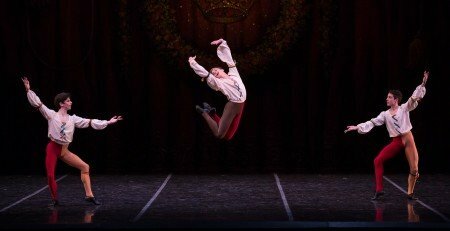 Artistic director Mikko Nissinen, who greeted the audience before the performance, mentioned that about 30 percent of the dancers currently in BB and its apprentice company have studied at the Boston Ballet School (BBS). In Les Passages, the first piece on the program, BBS students showed what high-quality classical training they receive. Their poise and technical prowess bode well for the future of the company. Heartfelt thanks to the faculty and staff who prepared them.